Recruiting people for genetics studies on Facebook. 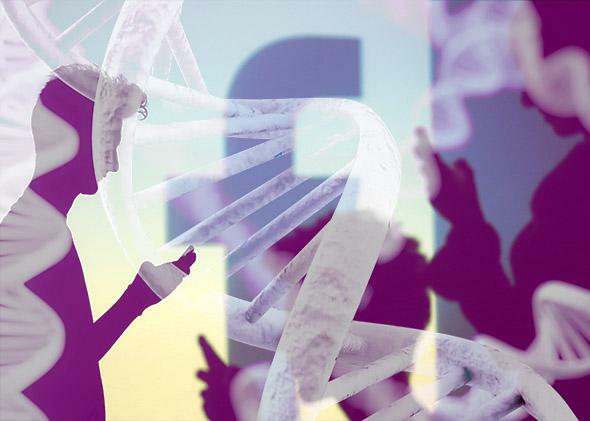 Genes for Good is soliciting genetic samples via a Facebook app. But why would an individual use such an app? Photo illustration by Juliana Jiménez Jaramillo. Photo by Dado Ruvic/Reuters and Thinkstock. Genetic researchers at the University of Michigan recently launched the Genes for Good program, an innovative study that’s using Facebook and an appeal to the common good to encourage citizens to donate their genetic samples. This initiative follows on President Obama’s State of the Union address launching the Precision Medicine Initiative, which seeks to collect genetic and other data from more than 1 million volunteers to power the transition to precision medicine. Both the Genes for Good study and the president’s Precision Medicine Initiative reinforce two key facts. First, we are on the brink of a revolution in health care delivery, in which disease prediction, diagnosis, and treatment will be based on an individual patient’s genetic and molecular profile. Second, this transition to personalized or precision medicine requires researchers to gain access to thousands or millions of genetic samples that will provide the statistical power to identify relationships among heredity, environment, and lifestyle factors in determining health outcomes. On the new Apple ResearchKit website, the American Heart Association’s deputy chief science officer, Eduardo Sanchez, writes, “Numbers are everything. The more people who contribute their data, the bigger the numbers, the truer the representation of a population, and the more powerful the results.” Bigger is better here. Enter enterprising trendsetters like Genes for Good, Apple’s ResearchKit, 23andMe, the U.K.’s 100,000 Genomes Project, and the Icelandic firm Decode. While their processes and goals may differ, what these entities all have in common is the goal of massive population testing to gain access to individual genetic information. Genes for Good is soliciting participation via a Facebook app. Similarly, Apple’s method is to connect medical researchers and potential study participants through an iPhone application design platform. But why would an individual use such an app? Presumably, to receive feedback. People like to find out stuff about themselves, right down to “Which First Wives Club Suit Are You?” The rapidly increasing popularity of fitness/diet/sleep-tracking devices, health apps, and the “quantified self” movement demonstrates that more and more people are interested in obtaining, and making decisions based on, their own health data. This trend toward “bottom-up medicine” is beautifully documented in Eric Topol’s new book, The Patient Will See You Now. However, when it comes to genetic research, this “stuff” often comes with some heavy baggage, including, most importantly, potentially life-altering health disclosures and the risk of loss of privacy. If you’re asked to voluntarily submit your genetic data, you should first ask the question “What’s in it for me? If I’m going to give up so much, what do I get and, more importantly, what do I want in return?” The answer is definitely not some lousy T-shirt. We and our loved ones will all benefit from advances in genetic research. Indeed, given this common benefit, some ethicists, such as British philosopher John Harris, have argued that we all have a moral duty to contribute our genes to medical research. While such an argument may be ethically sound, as a practical matter it is unlikely to induce the needed multitudes to voluntarily donate their DNA to research. Money is certainly a popular incentive as it is our driver and that of our economy. John Bear, a member of the faculty of medicine at Memorial University of Newfoundland in Canada has suggested that DNA donors should be paid $50,000 per sample. 23andMe will be paid up to $60 million by Genentech for access to 3,000 of the DNA samples in its database (amounting to $20,000 per sample). So why shouldn’t DNA donors who provide those valuable samples benefit monetarily? However, money may not be the most feasible incentive when it comes to giving up our genetic data. For one, requiring payments to thousands or millions of DNA donors would effectively be a burdensome tax on researchers, who are already scrambling for the shrinking dollars needed to fund the medical advances that will benefit us all. Also, money in and of itself would not assist the individual carrier of a gene associated with say, a serious form of cancer. That person, quite simply, would want the information. Just like the BuzzFeed quizzes, except that more is at stake here. The most promising quid pro quo to encourage genetic donations is therefore information and self-discovery. At this time, Genes for Good offers participants information about their ancestry and limited health information. It is a step in the right direction but may not be enough for what people want and need. Information about genetic disease risks is unfortunately off the table currently, due to the Food and Drug Administration roadblock imposed on the for-profit 23andMe. At the time of the FDA crackdown on 23andMe, the agency was concerned about several issues, including lack of informed consent, the potential for patient self-management, and false-positive or false-negative assessments presented by the company’s product. Without question, information that leads to “diagnosis of disease or other conditions or in the cure, mitigation, treatment, or prevention of disease” (as the FDA put it in a letter to 23andMe) invokes sensitive and important health knowledge. Not everyone wants to know his or her genetic health information, but a growing portion of the population does. Innovative entities like 23andMe and Genes for Good have made important strides to make contributing one’s DNA to research fun, interesting, and relevant. But even more innovation and creativity are needed to assure the public that in exchange for providing their genes for research they will get back information that is current, useful, and reliable. New ideas are popping up—companies like Miinome seek to provide a service that integrates your genetic data “with social, behavioral and environmental information to provide simple and useful recommendations that allow you to make more informed wellness and lifestyle choices.” More such efforts are needed, provided they are based on credible evidence and do not stray into scientific snake oil, as has been too common in the history of genetics. We must provide an appealing path for citizens who wish to do so to become full participants in the genomic revolution. After all, if we are going to put ourselves out there, let’s find out what we’re made of—genes and all.